If you’ve been following along here you probably suspected the difference between UAH and RSS are substantial enough to reach 95% significance. In this short post, you can see you were right. Significance is a measure of likelihood that the short term noise is creating the slope we see. Now since we’re looking at a difference between two series measuring the same thing, a simple reasonable method is to take the difference between the two series and look at the residuals for significance. 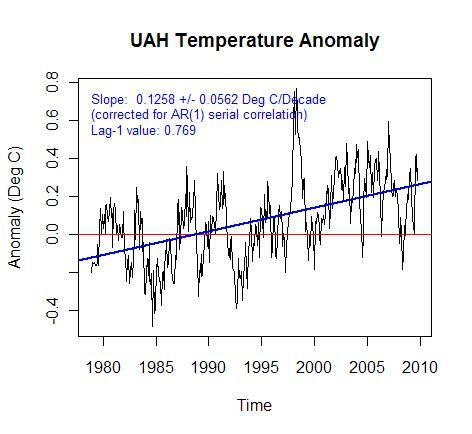 Global RSS and UAH temperature anomalies look like this. By taking the difference between the two anomalies, the graph below is calculated. You can see that if 95 significance in trend is 0.0104 the trend of 0.027 is almost 3 times outside of what is created by noise in the data. Much of this was created by a well known and still contested step at 1992 which was a particularly difficult satellite transition point. Now recently UAH and RSS started using different datasets for the first time. RSS continued using the old NOAA style satellites which decay in orbit over time while UAH switched to the AQUA station keeping satellite. The obital decay of NOAA-15 causes the instruments to measure different parts of earth at different times of day, gradually shifting over years. Imagine the difficulty in correcting temperature for all locations on earth based on time of day. You would need to quantify how the land, mountains, oceans, forests and even ice react over a day of heating. Each day being different over a year. RSS solved the problem with computer modeling of each grid square while UAH did it by measurement employing other satellites measuring at different times in the same day. I vastly prefer measurement to modeling in this case but that doesn’t mean RSS is wrong, just that there’s another black box step which is exceptionally difficult to verify. The new AQUA satellite used in UAH has a station keeping thruster which keeps the measurement time of each gridcell constant for years at a time. The thing I think some miss about this is that the huge massive corrections which must be implemented over a day are suddenly the same correction value from day to day – no change. Therefore errors in corrections no longer create artificial trends. We’ve got our first high accuracy global trend measurement –ever. The record only extends from June 2002 though and RSS is already experiencing a large divergence over that time. 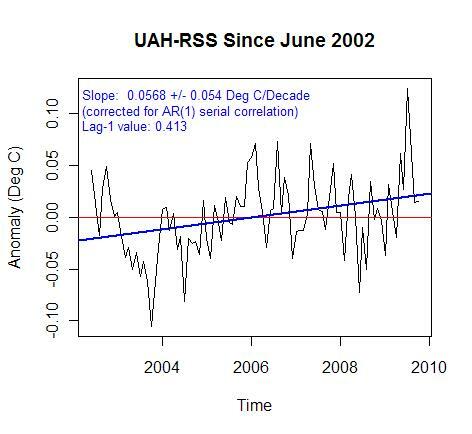 The last figure is UAH minus RSS for June 2002 until present. 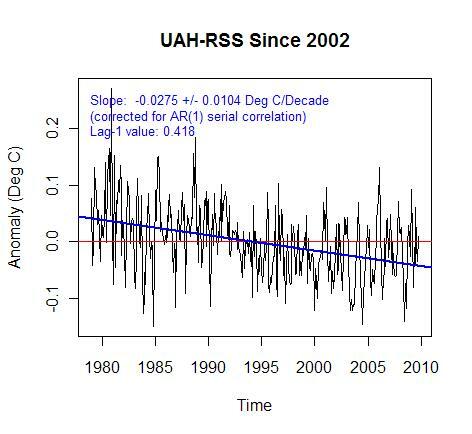 The data was re-anomalized after subtracting but the trend difference between the correct trend UAH and the old style calculation RSS is just past 95% significance. RSS is showing too low of a trend over this timeframe. Dr. Christy mentioned that it’s a result of overcorrection for diurnal shift of the old style satellites orbit. 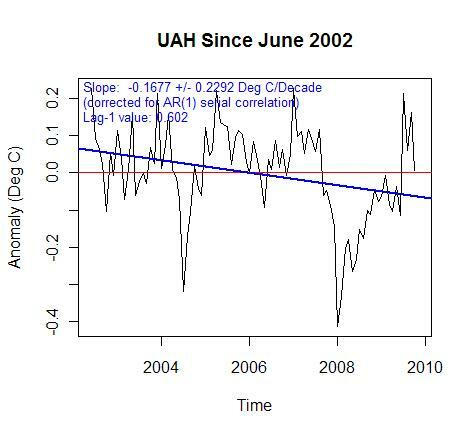 Either way the UAH with the better quality trend since 2002 is below. UAH negative trend nearly reached 95% significance. So of course we have to look at RSS. 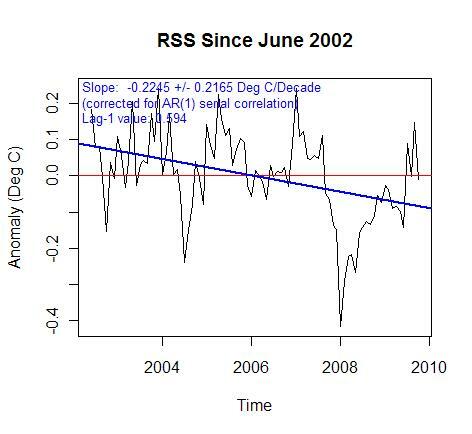 RSS is cooling outside of 95% significance for the past 8ish years. That’s the first statistically significant cooling I’ve seen so far. A short check of RSS on an annual basis shows that in 1978 over an 8 year window the trend is significantly negative. 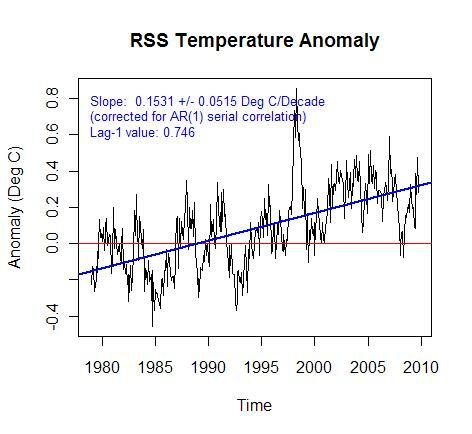 This means that by RSS there is a 95% certainty that cooling is occurring outside of weather variation since 2002. Not that it’s that big of a big deal, but cooling is cooling right? My opinion is that UAH is the superior metric still, remember though I’m just an aeronautical engineer and not an expert. As a side note I’ve got a beauty of a quote in a private email from a specialist saying that nobody outside of Alabama prefers UAH. I wonder if the fickle tides of science will be turning. Addendum: Dr. Steig left this quote on another blog. It was ironically sent to me by email just today (what are the odds). I do actually agree with his comment but the wording is funny. Rather than saying ‘warming (has/has not) stopped’ we can say cooling has occurred, however it’s not outside the statistical limits of significance of the higher frequency weather noise. In the case of RSS, it appears that the trend has become at least temporarily significant. The code for the post is here. In R, functions and libraries stay constant so you don’t know if everything is turnkey. Let me know if you have any problems with it. This entry was posted on November 9, 2009 at 11:15 pm	and is filed under Uncategorized. You can follow any responses to this entry through the RSS 2.0 feed. You can leave a response, or trackback from your own site. If you have a comment, it is probably best made here. I don’t get it. If the argument from warmers is that warming will occur at an ever faster rate, or at least it will occur faster than it has in the last thirty years, how is noting that the rise in the last twelve is diddly squat a “red herring”? It cuts right to the heart of the matter! Warming is slower than expected! It was a bit of a surprise but RSS isn’t working right during this 2002 – present timeframe. It will be interesting to see how RSS is fixed. Maybe #3 should say, probably isn’t working right as I don’t know for sure. Is it just me, or is there no daylight now between the style and content of articles written in RealClimate, commondreams.org and the old Pravda? Well that is exactly the problem for them. It’s just one more anomaly that they can’t explain, to go along with a long list of other ones. And rather than admit the science isn’t there yet, they were rather just dig in deeper and try and obfuscate the matter. Too bad for them that isn’t a very effective strategy, it just makes them look dishonest. Jeff ID, the title of your third plot down is incorrectly labeled. I like your approach (since I do these differences also) in looking for significant differences between temperature data sets. When found I judge it important to look for differences. “is there no daylight now between the style and content of articles written in RealClimate, commondreams.org and the old Pravda?” Huge difference – RealClimate and the old Pravda use different alphabets.